Are you looking for creative solutions to things such as memory, fatigue, organisational issues, that are getting in the way of focus on your core business? Empowering focus on the day to day business. Whether a new or established business owner, employee, job seeker, corporate, or support organisation, we are here to provide a ‘bespoke’, person centred, professional and friendly service, to bridge the gap between health and work and empower YOU to focus on YOUR business. We are happy to work with you from your premises, remotely, or from other business locations as required. Call 0796 975 7041 for your free information call. We look forward to hearing from you. 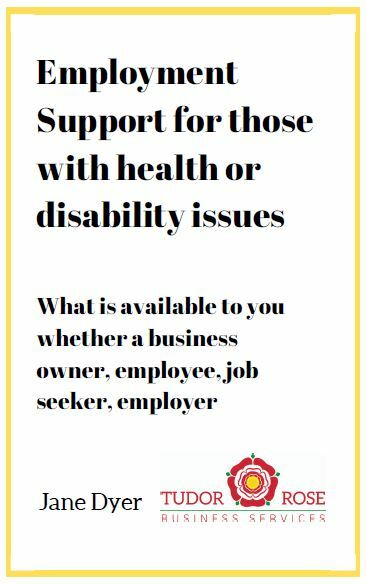 Download your free copy of my ebook "Employment Support for those with health or disability issues" and find out what is available to you. You have successfully subscribed. Please check your inbox for details of how to download your ebook. Tudor Rose Services Ltd © 2019 All Rights Reserved. Registered in England 09555412.